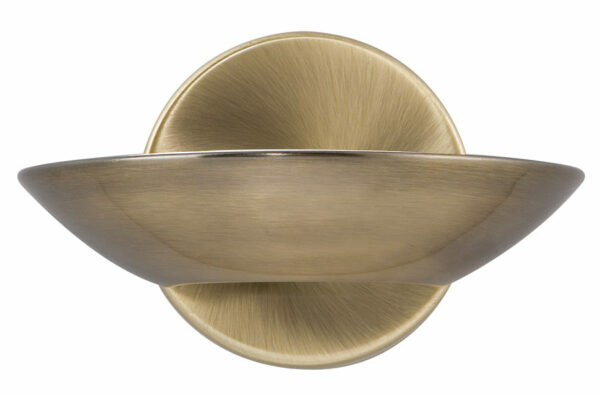 This LED dish wall washer light in antique brass finish with frosted glass is modern, attractive and energy efficient. Featuring a circular wall mount and horizontal curved dish, with frosted glass lens for a softer light. Fitted with 7.5w of warm white LED’s that produce 510 lumens. Now you can wash your wall with bright upward light with this compact wall bracket. The light is topped with frosted glass which diffuses the integral LED’s beautifully and avoids glare. Add as an additional living room or dining room light to compliment a traditional interior style. This traditional light is supplied by Searchlight who manufacture some of the best traditional and modern classic designs such as the LED dish wall washer light in antique brass finish with frosted glass you see here.